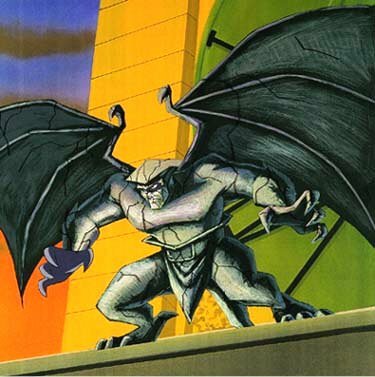 Powers/Abilities:Like all gargoyles his strength is superhuman, but even by their standards he is incredibly strong. He has wings that allow him to glide, not fly, on the winds. He can use his claws to climb surfaces unreachable by humans. During the day, like all gargoyles, he turns to stone. This allows him to heal faster then humans. Also, he does not age during while he "sleeps." However, he is vulnerable during the day. History: Goliath was born into a gargoyle clan inhabiting Castle Wyvern in 10th century Scotland. The gargoyles co-existed with humans somewhat uneasily, but generally peacefully. The relationship was almost symbiotic with the humans sheltering and protecting them during the day, while they protected the Castle by night. 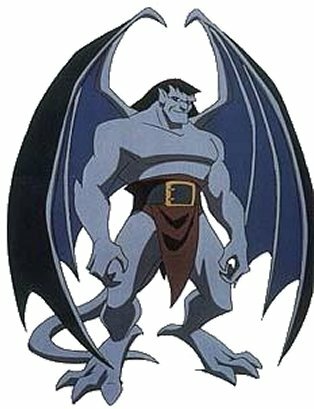 Gargoyles normally don't give each other names, just referring to each other as "friend" or "brother" or such, and Goliath was given his name by humans (specifically Prince Malcolm, circa A.D. 971). At first, he considered it merely a convenience for the humans, though he eventually he came to consider it his real name. The name was given to him because of his great size and strength, but also because of the fear they felt toward him. As he grew, he fell in love with a female gargoyle he called "My Angel of the Night" who would later became known as Demona. He also assumed leadership of the clan, succeeding the gargoyle that would later become known as Hudson. In A.D. 994, Viking Raiders attacked the castle. The gargoyles and humans together routed the Vikings. At the urging of Demona and the human captain of the guard, alongside Hudson and the gargoyle beast later known as Bronx, he chased after them. Night fell before he returned home. The Vikings again attacked aided by the captain of the guard. The Vikings took many human prisoners including the lady of the Castle, Princess Katharine, and her sorcerer aid known as the Magus. Most of the clan was destroyed. Three young gargoyles (later known as Brooklyn, Broadway, and Lexington.) who had been sent into the rookery (where gargoyle eggs are kept) survived. Demona, who had conspired with the Captain, fled. Horrified by what he found, Goliath and the surviving gargoyles set out after the Vikings. They attacked the Vikings and overcame them. However, the Magus, who disliked gargoyles in general and believed Katharine had been killed, used a spell to turn all the gargoyles except Goliath to stone. However, when Goliath returned with Katharine alive, he immediately recognized his mistake. Goliath, having not much to live for, had the spell cast on him as well. Princess Katharine and the Magus, along with a boy named Tom, promised to watch over the eggs. The spell was to last until "the castle rose above the sky." In the late twentieth century, a millionaire named David Xanatos bought the castle and had it shipped stone by stone to New York. He then placed it atop a skyscraper, which he owned. So the castle was raised above the sky and the gargoyles awakened. Xanatos was not at all surprised. Soon after their awakening, the castle was attacked by a group of commandos. The gargoyles fought them off, but the resulting battle drew attention to the castle. A police detective named Elisa Maza investigated and soon discovered the gargoyles. Goliath frightened her and she fell off the castle. Goliath swooped down and saved her. Sensing that Goliath and his clan were peaceful, she offered to show him around New York. Xanatos told him that the attackers had stolen computer disks from him. The next night they went out to explore. At Goliath's request, Elisa showed him what would be a threat to his clan. At Central Park, the same group of commandos that attacked the castle attacked them. Goliath was shot with a tranquilizer dart and had to be hidden during the day. Elisa got rid of the commandos, and stayed with him through the day earning his trust. Returning to the castle, he was reunited with Demona, whom had acquired immortality. She convinced Goliath and the clan to help Xanatos retrieve his "stolen property." Together they raided an airship, which Xanatos claimed had one of the computer disks. Demona, with great zeal, destroyed the airship. When he met again with Elisa, she confronted him with this. She had seen him and Demona fleeing the airship. She revealed that she had discovered that the commandos who had attacked them had in fact been working for Xanatos. He had been tricked. Goliath returned to the castle in anger only to find that Demona and Xanatos had attacked his clan. A battle ensued with Goliath and his allies winning. Demona was believed killed and Xanatos was arrested. Comments: Voiced by Keith David. Profile by Matthew A. Ilseman. He notes "This is a summarization of the first five or six episodes. I will not summarize the rest because it would take to much time and I'd rather not give away many of Goliath's following adventures. There is more information in the other profiles. The best site about the show is at www.gargoyles-fans.org, which has character profiles and summaries of the episodes." Goliath, any of the Marvel Comics heroes of that name.